If you’re a resident of Camas and you’re currently watching an army of sugar ants march across your home’s interior surfaces, you’re not alone. 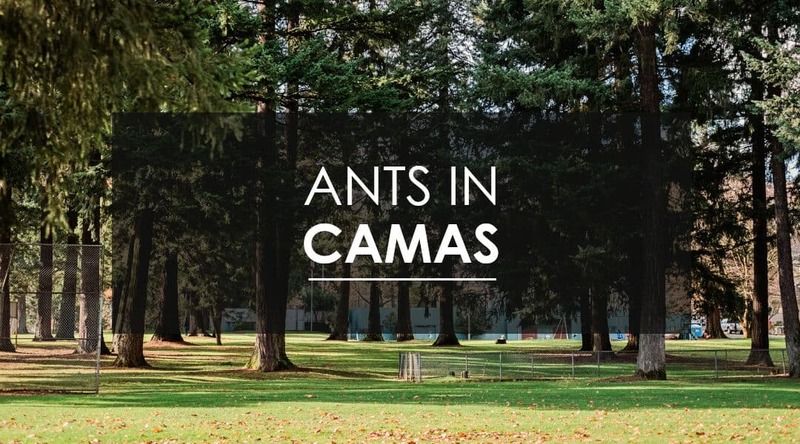 Camas is a wonderful place to call home and the sugar ant population seems to feel the same way. Beginning in late February, sugar ants, also known as odorous house ants, begin to become increasingly active and often become a problem in Camas homes and businesses. The term “sugar ant” is somewhat of a catch all name for ants that are attracted to sweet foods. Glucose is this ant’s main fuel source and the insects are incredibly skilled at locating sugary substances thanks to the sugar receptors that are located on their antennae. Sugar ants are a hardy species. Worker ants will continue to forage even with missing or mangled legs and the queen ant is still able to lay eggs even if her abdomen is crushed. Interestingly, the odorous house ant, or sugar ant, is one of only a handful of ant species in the Camas area that can survive the excavation and environmental upheaval that occurs in new residential and commercial areas. Sugar ants are so well adapted to survival in our climate and landscape that it is not uncommon for a single odorous sugar ant colony to stretch over an entire neighborhood and beyond. Want to see if your ants belong to the same colony as your neighbor’s ant? Carefully place two workers in a test tube and see if they fight with each other. If they peacefully coexist, your neighborhood may be home to a really big ant colony! If you’re suspecting that the sugar ant’s resilience makes an ant infestation in your home or business difficult to eradicate—you’re right. Why do sugar ants come into homes? Contrary to popular belief, the sugar ant’s primary motivation for entering a structure is not food. Although they are attracted to sticky spills and those leftover toast crumbs on the counter top, the ants’ top priority is finding water to sustain the colony. That’s why sugar ants are often found in bathrooms, kitchens, and surrounding pipes that are covered in condensation. They are always on the lookout for a reliable source of water. Once they find it, they set up shop and begin to create a nest. It can be very unsettling to find your home filled with trails of ants, but one thing that you don’t need to be too worried about is ant bites or stings from sugar ants in the Northwest. Some ants have stingers and when they come into contact with humans they will use these stingers to push venom through the skin. Sugar ants do not have stingers. They do have the ability to pinch with their mandibles, but it’s uncommon and not very painful. Only in rare cases when an individual is highly allergic would a bite from a sugar ant be dangerous. How do I keep sugar ants out of my home? The best way to ensure that your home is free of sugar ants is to keep them from ever entering in the first place. Some simple precautions can help to make your home less appealing to sugar ants. Remove the trash: Don’t keep trash that contains food waste inside your home. Move to an outside receptacle at least once per day. Keep surfaces free of crumbs and spills: Wipe the surfaces of countertops and tables and sweep the kitchen floor regularly. Limit eating to the kitchen whenever possible. Run the dishwasher regularly: Even when dishes have been rinsed there is a chance that food residue will attract ants. Try to run the dishwasher immediately after loading. Keep your lawn maintained: Keep vegetation cut back, especially in areas that are within 1 foot of your home’s exterior. Don’t use repellents: Some of the “contact kill” repellents that are available at the hardware or grocery story will actually drive ants indoors and make an ant problem worse. Don’t let standing water accumulate: Standing water and moist wet ground attracts ants. Check the exterior of your home for proper drainage. There are a variety of DIY type products that can be purchased to combat a sugar ant infestation. These products generally fall into two categories, baiting and quick kill treatments. FOR YOUR SAFETY: Both over the counter spray ant killer and ant bait can be poisonous and dangerous to both children and pets. If you choose to use these products, always read the safety precautions and follow safety instructions closely. Aspen Pest Control does not recommend the use of over the counter sprays to kill ants. We find that spray ant killer tends to initially appear to work, but in reality it tends to fracture the ant colony and eventually causes the colony to become stronger by building additional nests in new locations. Ant baits tend to work better because the foraging ants take the bait back to their nests. That said, the potency of the DIY products are often not strong enough to impact the entire colony and this often creates a need for a professional ant exterminator. We always recommend consulting a professional when dealing with ant control. The technicians at Aspen Pest Control are familiar at eradicating infestations in Camas, WA and will inspect your home, determine the extent of the problem, and recommend the best long term solution. Aspen treats ant infestations with a specialized sprays and baits that are non-repellent. These products work by disrupting the life cycle of the colony. The treatment is proven and thousands of happy clients in the Camas and surrounding areas use our service to protect their homes during high sugar ant activity months. Aspen Pest Control is confident in our sugar ant control and we happily offer our clients a guarantee of service. If the sugar ants reappear after treatment, we will return to treat the problem free of charge. Who can I call for ant extermination in Camas? If sugar ants, carpenter ants—or any type of ant—are a problem in your home, please know that know that you’re not alone. Sugar ant infestations are a common problem in the Camas.